This entry was posted in Manicure Monday and tagged Blue Eyed Girl Lacquer, glitter, indie, Lynnderella, matte, neon, pink, white. 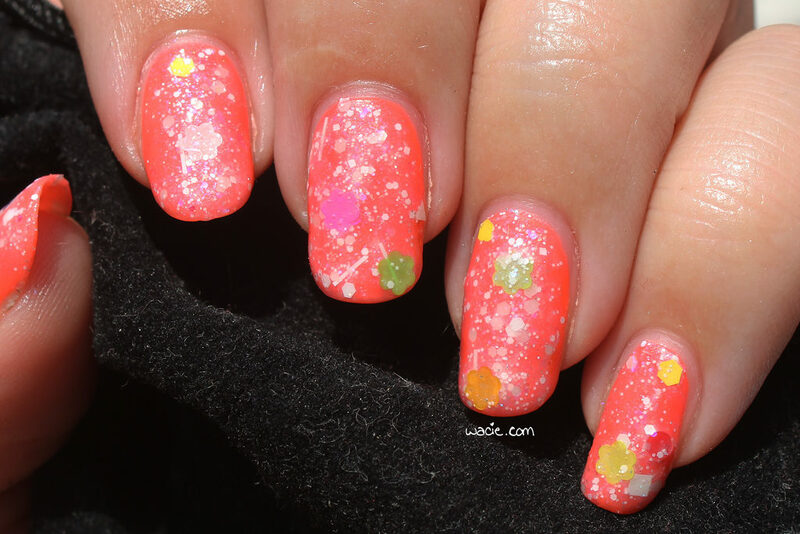 « Swatch: Bee’s Knees Lacquer’s Cozy in There? Haha I like the names of both these! That topper is a stunner. I can’t help but LOVE the name. I also haven’t seen a Lynnderella in the wild in such a long time! The bigger flower chunks are really fun, especially for summer! I get people asking me the name of the polish I’m wearing often. I don’t think I could say “Look at these assholes” with a straight face. What a fun summery combination! Oh wow! I just love this color combo! I’m not usually a fan of shaped glitters but I do like this combination. It’s fun and flirty which are both perfect for summer. I love this. It screams summer and popsicles to me!